It is no secret that kale is a powerful superfood, with many health enthusiasts adding it to their morning smoothies or munching on a kale salad for a quick lunch. But did you know that kale and other leafy greens could have more of an impact on your health than you realize? Unfortunately, many people turn their nose up at leafy green vegetables, unused to the natural taste because tastebuds have become desensitized to real food. Once you get over that hurdle and begin to enjoy these powerhouse vegetables, here are a few you absolutely need to add to your diet and why you should. Greens can’t be that good for you, can they? Actually, numerous studies would suggest otherwise, linking a diet rich in leafy greens to a significant decrease in age-related cognitive decline, and sharper memory skills among older adults. 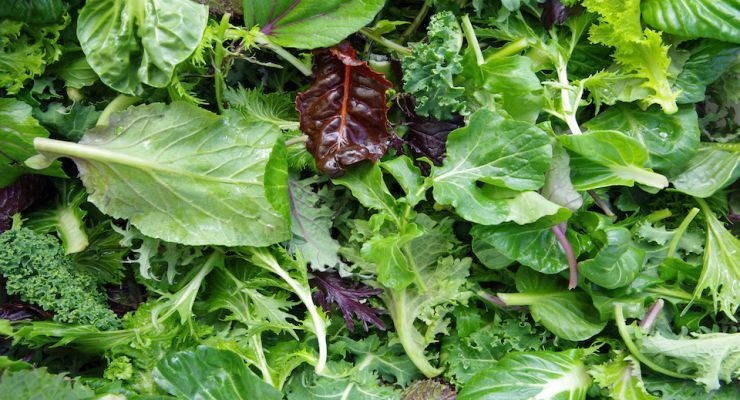 Dark, leafy greens can also have a positive impact on heart health, bring a wealth of antioxidants, fight diabetes, prevent eye degradation, provide your body with essential nutrients, and even help burn fat. A good rule of thumb when browsing the produce section and trying to remember which greens top the list as the actual health all-stars; the darker the green, the more nutrient-dense the vegetable. You’ve probably heard that great things come in small packages. Never has that been truer than in regards to the veritable health powerhouse that are microgreens. Technically, microgreens are the underdeveloped sprouts of various vegetables and herbs that are harvested just a few weeks after planting. Studies have shown that these remarkable greens have nearly 40 times more nutrients, such as vitamins C, E, and K than when they’re fully grown. Plants need a powerful start, with proper vitamins, minerals, and antioxidants to support their growth. When you enjoy microgreens, you are ingesting the rich life-force of the young plant. The good news is since you can grow them right in your home, microgreens are always in season and are incredibly delicious when added to salads, sandwiches, or just enjoyed raw as a healthy snack. Kale is one of the most famous health foods, having received a popularity burst as a media darling in the last few years. Fortunately, it deserves all the attention as it contains a potent antioxidant known as lutein that is essential for eyesight, beta-carotene, and vitamins C and K. If you need any more convincing to add this leafy green to your diet, it has also been shown to have cancer-fighting properties due to the presence of the phytonutrient sulforaphane. Kale is at its healthiest when consumed raw, but steaming this vegetable will still allow you to reap most of the benefits if you can’t stomach the slightly bitter taste. Mustard greens only rank slightly below kale in terms of beta-carotene content which make them a fantastic choice when you wish to try a leafy green that is a little less bitter and has a slight peppery taste. Beta-carotene is an essential nutrient because it can be converted into vitamin A in the body which in turn benefits bone and eye health. Plus, mustard greens help protect internal organs from the ravages of free radicals by encouraging detoxification enzymes. Cooked or raw mustard greens make excellent sides to any main dish or can be added to a salad for a burst of flavor. Though spinach won’t immediately turn you into an iron-pounding Popeye, it is full of potassium which is excellent for improving muscle function and strength and normalizing blood pressure. It is also a great source of folate, which is a vitamin helpful in preventing breast cancer development in older women, and neural tube defects during pregnancy. Spinach is an incredibly versatile vegetable and is delicious when added to soups and salads, but it delivers a wonderful flavor to any dish. Collard greens are more of a hidden treasure in the world of leafy greens and are often overlooked in favor of the more popular entries listed above. However, they certainly provide their own wealth of benefits that make them a wonderful addition to your diet. Collard greens are one of the best sources of dietary fiber when compared to other leafy greens, helping to prevent digestive issues. Plus, they contain high levels of vitamins K, C, and beta-carotene which are essential in encouraging heart and bone health. It may take some practice to figure out how to best enjoy the mild flavor and tough texture of collard greens, and it is important to remember that they will need a longer cook time than other leafy greens. Hey Buddy!, I found this information for you: "Top Greens You Should be Eating and Why". Here is the website link: https://www.tropicalhealth.com/top-greens-eating/. Thank you.